First of all, let me express the sincere thanks of UPF to everyone here today: to the Noble Baroness Howells for so graciously hosting us in this "Mother of Parliaments," to our distinguished speakers for so articulately, passionately, and eloquently sharing their insights, to our Nigerian delegation for making so much effort to be here with us on this very special occasion, and to our entire audience for caring deeply enough about Africa to give up your precious time on so glorious a summer evening to support with your presence. Ladies and gentlemen, as you may know Universal Peace Federation's vision of the peace that humankind has so deeply longed for and yet so tragically failed to achieve throughout history is far more than the mere cessation of war or of armed conflict. Rather, the peace we seek is an all encompassing and all pervasive reality consisting of a positive state of harmonized and loving relationships among all people and between all peoples, as well as between humankind and God's creation as a whole, through which the maximum, God-given potential of each person and of all peoples can be realized for the well-being, happiness, and prosperity of all. Probably the two most profound principles that we seek to live by and to promote are first, the need to think and act as "one human family under God" and to learn to "live for the sake of others." This means that international organizations like the African Union (and its predecessor, the Organization of African Unity) that are proactive and forward thinking in seeking to realize such ideals are very important instruments for building lasting world peace, transcending barriers of tribe, nationality, race, religion, and ethnicity and very much deserve to be celebrated on important occasions such as this, their 50th anniversary. Although very much a European, I have been fortunate to have the opportunity of getting to know parts of Africa well over the past 30 years or so. In that time I have come to truly love both Africa (where I have visited many times and where I am proud to hold the position of national adviser to UPF in Benin), and my experience on both continents has given me a deep appreciation of the special qualities and potential of each. My heartfelt conclusion is that we truly need each other and should learn from each other. It has also enabled me to see the value of bringing our two continents together in ever closer harmony for the benefit of the entire world. That indeed is fundamentally the vision and hope of our Founders, Rev. and Mrs Sun Myung Moon and something they have been working towards throughout their lives. Their vision is vast and is exemplified by such projects as the construction of a massive International Peace Highway linking all the hitherto separated and divided parts of our world and of the divided human family with each other. Not least, it would connect Africa and Europe through that superhighway by means such as a giant tunnel under the Straits of Gibraltar and the Bosphorus Bridge. This would enable one to drive from (say) Cape Town in the far south to Helsinki or Moscow in the far north and to freely and rapidly carry both people and goods along a superhighway, greatly facilitating trade and human interaction of all sorts. UPF is based on the vision that humanity was created to be "One Family under God" in which there should be none of the divisions and barriers (of race, religion, ethnicity, nationality, and culture) that currently separate and divide us and lead to such destructive conflict, but one in which all humankind can live as one, sharing all of its riches (both material and spiritual or cultural) for the benefit of all. All of its projects are geared towards achieving those goals in one way or another. As we all know, the relationship between Europe and Africa has gone through many phases and many great changes over the past several centuries from the time of the early adventurers and explorers who first ventured south from Europe and began to map and even to create the first European settlements, through the process of colonization and missionizing, the era of colonial rule, the period of decolonization, and more latterly independence and home rule for most African States, most of whom are now members either of the British Commonwealth or of France's Francophonie. At the height of the era of decolonization in the late 1950s and early 1960s, then British Prime Minister Harold Macmillan famously spoke of "the winds of change sweeping across Africa." But I would suggest that, by comparison to that time, the changes that we are witnessing today are nothing less than gales or even hurricanes of change, the like of which we have simply not seen before. In the past the relationship between Europe and Africa has often been like that between a parent and child with Africans often adopting an attitude of dependency and relative passivity in the relationship. Often Europe was like a good and benevolent parent but too often like a selfish and even an abusive one. I believe that times are changing profoundly in that regard. Far more even than the increasing discovery of vast natural resources that raise the prospect of real wealth for Africans for generations to come is, I believe, the increasing spirit and heart of self belief and self reliance among the younger generation in Africa and their conviction that the continent can and should stand on its own two feet. Two years ago my dear colleague and our international Secretary General, Taj Hamad, was invited as an observer to the annual AU Summit in Guinea and, as an African himself, listened with incredulity (turning to wonderment) for almost a whole day as young African entrepreneurs who had been invited to address the Summit participants berated the elder statesmen of Africa for not believing enough in Africa's potential to stand on its own two feet and to demonstrate a "can do" spirit. As Africans come to believe in themselves more and more, they will surely show that they can increasingly accomplish great things on their own and be less and less dependent on Europe or other outside powers. We believe that Europe should continue to have a benevolent heart towards Africa, helping it in every way to solve its problems and achieve its dreams, but in the shorter term more as a parent towards its now grown up child and increasingly as equals and eventually more as brother to brother or sister to sister. If Europeans are open and honest about their shortcomings and failings in relation to Africa and keep seeking to extend a helping hand to it, I believe that the natural big-heartedness and capacity for forgiveness of African people will lead eventually to the bad legacy being forgiven, the good things being remembered, and a deep level of harmony and mutual respect being possible. UPF’s experience with Africa leads us to believe that for the relationship to proceed in this positive way, special attention needs to be given to the areas of empowerment of youth and women. These are probably the areas where Africa can benefit most from European help. More than any other groups, today’s young women and men will impact how people in both rich and poor countries live in the 21st century. Unfortunately, hundreds of millions of youth — especially young women — lack education, skills, job training, employment opportunities, and health services thus effectively limiting their futures at a very early age. As a result, youth may react by showing harmful attitudes both to themselves and to the wider society. Too often youth are perceived as contributing to society’s problems rather than as the important assets for the economic, political, and social life of their communities that they are or, properly invested in, can become. Addressing key global threats — like the spread of HIV/AIDS, growing poverty, and political instability in developing countries — depends on protecting the rights and well being of youth and providing them with the support they need to contribute to the health and well-being of society. In closing let me say that we see three areas as being especially vital to today’s youth in developing countries: namely education and training, providing economic opportunities, and improving health and sexual well being. If Europe can help address these issues in Africa it will have a tremendously positive impact on the future of the relationship between our two continents. 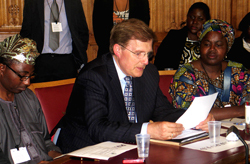 Address to the June 4 Africa Day commemoration in the House of Lords.